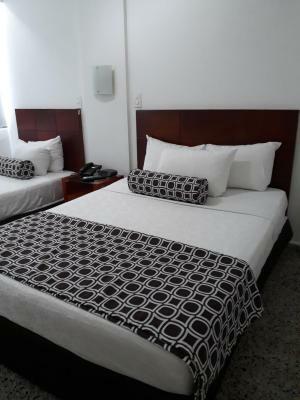 Lock in a great price for Hotel Tequendama Inn Cartagena de Indias – rated 8.1 by recent guests! The room is very clean, and spacious housekeeping is doing great job. Breakfast was very good a lot of options home food. The property is well located. I dont think is worthy the money for what they offer!!! Excelente atención, las instalaciones y habitaciones siempre limpias, todos muy dispuestos a colaborar, los desayunos tenían variedad y excelente sabor de la costa. La habitación, aunque de menor calidad a la de las fotos, estaba limpia y el aire acondicionado funcionaba bien. Llegué un poco temerosa por ciertos comentarios de usuarios. El hotel es excelente, la ubicación ideal, cerca de todo y también de la ciudad amurallada. La conducta ecológica del hotel merece una felicitación especial. Lo recomiendo 100%. La ubicación del hotel, a 2 cuadras de la playa y cerca del centro histórico. lugares cerca para cenar. La atención del personal excelente. muy buena relación precio calidad. 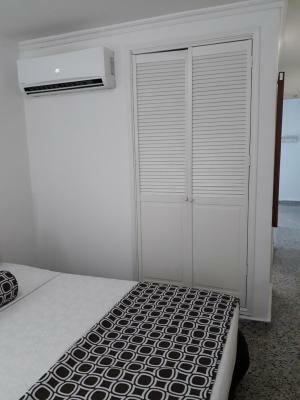 Quarto confortável, amplo, cama boa, banheiro bom, hotel bem localizado. Bom custo benefício. NOS ENCANTÓ EL SERVICIO OTORGADO POR RECEPCIONISTA, SRTA. LORENA, QUIEN NOS HIZO SENTIR MUY CÓMODOS, SOLUCIONÓ UN PROBLEMA QUE TUVIMOS EN TIEMPO RECORD. MUY AMABLE Y CARIÑOSA. 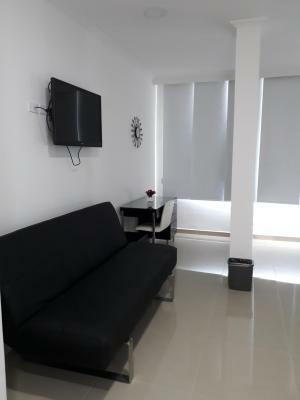 Hotel Tequendama Inn Cartagena de Indias This rating is a reflection of how the property compares to the industry standard when it comes to price, facilities and services available. It's based on a self-evaluation by the property. Use this rating to help choose your stay! In this modern building, guests can enjoy a drink in the rooftop hot tub with views of Bocagrande. All rooms have garden views and free Wi-Fi. El Laguito Beach is 0.6 mi away. Air-conditioned rooms at Tequendama Inn feature elegant contemporary décor with white interiors, seating areas with designer chairs and touches of color. There is flat-screen cable TV and private bathrooms include toiletries. Guests can enjoy breakfast with tropical fruits and world-famous Colombian coffee in the room. 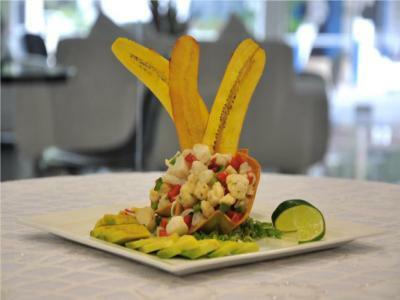 The restaurant serves international cuisine in an elegant setting. Room service is available. Tequendama Inn Cartagena de Indias is only 1.2 mi from the picturesque Walled City. The tour desk can arrange shuttles to Rafael Nuñez Airport, a 15-minute drive away. When would you like to stay at Hotel Tequendama Inn Cartagena de Indias? This air-conditioned room features a telephone, free Wi-Fi and a private bathroom with a shower. Located in Bocagrande, the most important shopping area of Cartagena, this hotel has 28 rooms and excellent service to provide a pleasant experience during your stay. The facility has two terraces with whirlpool tub and a restaurant with different food options caribbean sea. In addition, its proximity to major beaches of Bocagrande, Castillo Grande and El Laguito, allow you to enjoy all the tourist attractions of the capital of Bolivar. House Rules Hotel Tequendama Inn Cartagena de Indias takes special requests – add in the next step! Hotel Tequendama Inn Cartagena de Indias accepts these cards and reserves the right to temporarily hold an amount prior to arrival. The location ist so far from all restaurants bars and activities. You need taxi all the time to go somewhere. The attitude of the staff is the worst i have ever seen among my travels. At the beginning they refused taking credit card asked for cash only, although they have machine they didn't want use it. The forced me to withdraw cash. The doors looked at night for security reasons and guest aren't provided with a key copy, every time you coming back you need to wait to get access to your room. One night i came back late i was waiting almost 1 hour outside for lady to come open the door for me, she were gone somewhere that was extremely unpleasant and i didn't complete my stay. I don't understand why cant guest have key copy? Also you are not allowed to bring guests to your room. I think it invents the privacy. Its not hostel. Its a private room that you paid for. Beds are extremely hard not comfortable to sleep. New Year’s Eve party went on for a long time and was extreme loud on the terrace. The sound echoed throughout the entire place. When booking it, I didn’t realize this place was going to be party central and the reception did not extend and invite. Very clean rooms but was very pricey. Poor breakfast service, not very fresh in my opinion. When we arrived the room wasn’t clean, it was neccesary for us to request it. No Pool, just a jacuzzy. No amenities. Good location and Wifi service. The wifi went off a few hours after i entered the hotel. After 2 days i was still with no internet!! Room too small !!! Some noise at late hours from a bar or disco near the hotel.